Future of Architecture: With civilization, Architecture has also evolved. What shall be the shape of Architecture in the future, when our main concerns shall be space and sustainability? What will our homes, towns and cities look like in the near as well as the distant future? Will there be any space to retain our intrinsic vernacular? Two teenagers sit facing each other on a train. 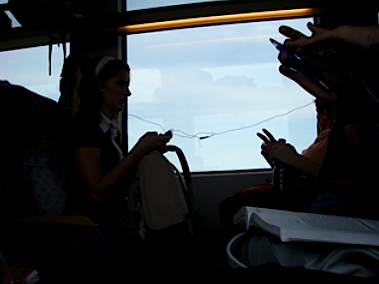 They are having a conversation, but they are also wired, each with an earpiece from a shared portable stereo (an iPod). They are sharing a playlist, presumably enjoying an intimate and localized mood. Their split stereophonic encounter goes unremarked by the other passengers, several of whom are busy talking to friends miles away via mobile phones. This scene perhaps says something about the future of architecture. It is mobile, everyday, improvised and unremarkable. I’ll have something to say about the impact of mobile devices on architecture in a moment, but it is worth noting at the outset that prediction is generally more exciting than actuality. The future is more memorable than the present. When they are upon us, and widely adopted, technological innovations tend to blend into the background. The scene on the train may have excited astonishment 20 years ago, but now goes unnoticed. That technologies might go unremarked is a major theme in computing. “Pervasive” and “ubiquitous” are the catchwords of contemporary digital media. It is already happening. Mobile phones, iPods, digital cameras, and GPS navigation are in use everywhere, and are widely accessible. They make extensive use of globally connected networks and already interoperate with that “network of networks,” the Internet. The computerized components of these devices are receding into invisibility, and the predictors say that the devices themselves will become less and less conspicuous. Some researchers talk of microprocessing “specks” that can be inserted into fabrics, jewelry and scattered through buildings and across the urbanscape. If the future is unremarkable then it might also be dusty. What are the implications of pervasive digital media for architecture? They certainly provide a challenge. Architecture is ostensibly about stationary, rock-solid bricks and mortar — settlement. Contemporary pervasive technologies point in the direction of movements, flows, navigation and the life of the nomad. Perhaps contemporary pervasive media foretell of a reduced dependence on stationary dwelling and a reversion to life on the move. Buildings may serve as waystations for digital nomads, mere supplements to aid network pilgrims on their way. I have been involved in some experiments in just this area. We now take it for granted that meetings between business associates, consultants and clients, and of research teams, do not need to take place in designated custom-made meeting rooms, or customized architecture. I work in the centre of Edinburgh and choose often to meet with associates in any of the myriad coffee shops, pubs and foyers. Occasionally we meet outside, weather permitting, and on train journeys down to London. Sometimes these encounters are unplanned and improvised, and their effectiveness is enhanced in no small part by laptops, mobile email, wifi networks and mobile phones. We recruited some designers to address how mobile phones could be used in the context of such meetings, and we introduced an interesting new technology, that of mobile camera phone image recognition. If your phone has a camera then you can take a picture and send it to a special phone number. A computer server receiving the image then tries to match the picture against a database of images, using smart image-matching algorithms. Depending on the match it will send a message back to you and your friends. We like to think of this technology as a means of depositing and unlocking information in the environment, accessed via the immediate and pervasive medium of your mobile phone. Our designers came up with the idea of using this technology to “log in” to a space. As you enter “Elephants and Bagels,” a local eatery (reputedly one of the places JK Rowling sat to write her first Harry Potter novel), then you take a picture of the doorway and send that to the phone server, which then notifies people on your FaceBook friends list that you are there. If they wish to join you they can. Irrespective of the wizardry and usefulness of this technology it provokes interesting metaphors for architecture. What is it to “log in” to a space? It also emphasizes some of the points I raised earlier. The building user is after all highly mobile and could choose to be in this place or another place. The essential encounters with others can be negotiated and improvised while on the move. The use of space for meeting (and other business) purposes is also improvised. The space is ordinary and everyday, and is ostensibly customized according to the meeting’s purpose with the aid of pervasive digital technologies. The experiment described here needs to be seen in the context of other technologies that we are developing, and researchers around the world are engaged in similar experiments relating digital technologies to space in interesting ways. The climate in which such design experiments can be undertaken is itself pervasive, and improvised. With ready access to interoperable network innovations such as online social networks (FaceBook), online maps, resource sharing, persistent 3d environment (SecondLife), haptic gaming devices (the Nintendo Wii), robots, mobile sensors, hand-held Internet access and further mixed realities, the environment is ripe for students of architecture to engage in making the future. Architecture’s future no doubt lies with new and exciting forms and materials. But it will also involve a move to the low-key, everyday world of ordinary things, social relationships and activities: an unremarkable architecture that requires remarkable architects to take advantage of developments in pervasive digital media. The project sdescribed above include software developed by Mobile Acuity Ltd. The project was funded by the UK Arts and Humanities Research Council, and the research team includes Mark Wright, James Stewart, Henrik Ekeus, Penny Travlou, John Lee, Jia Li and Robin Williams.